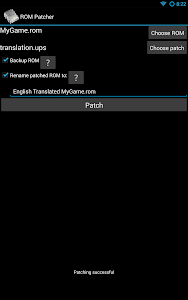 ROM Patcher is a ROM/binary file patcher that supports many patch formats, as well as decompressing ECM files via unecm. Simply choose a file to patch, the patch itself, and optionally an output file name and tap "Patch". 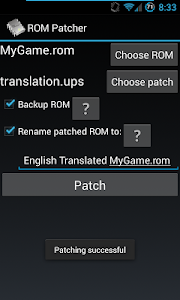 Apply translations to your own ROMs/ISOs (not native Android games). No ROMs, ISOs or patches are included. All requests for ROMs and ISOs will be ignored. Q: How do I hack ? A: Contact the author of that app, not me. 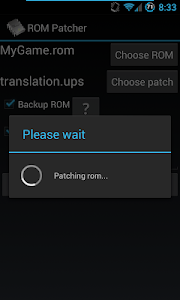 There is no guarantee the patched ROM will work with any third party apps. 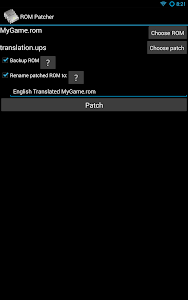 ROM Patcher only applies a patch to a file. 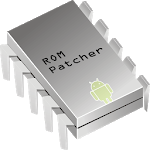 If you provide an incorrect ROM or patch, any errors that may occur are not the fault of ROM Patcher. Q: There is no file extension! A: Ensure you know where the files actually are. Also, make sure the patch file extension matches one of the ones listed above and you are not trying to patch a patch file. This app uses components from MultiPatch for Mac which is licensed under GPL. The source is available if desired.